The commonly used and recommended substrate is 5 parts play sand to 1 part cocofiber. The other sands or stones listed here are safe for using in your crabitat in select areas but not as the primary substrate. Hermit crabs require deep, moist sand to burrow and molt properly. Collecting sand from the beach is not advised. In most areas it is illegal to take sand from the beach. In many areas of the world the beach sand is heavily contaminated from polluted waters. Most owners use play sand found at their local hardware store. Please take note of the quality when purchasing play sand. If in doubt ask other hermit crab owners what they use and ask how it works when damp. Some play sands are low-grade sand made from crushed rocks and have impurities since they are used for the building industry. Choose a play sand intended for a children’s sand box; this is good quality sand and has been cleaned and sanitized. If in doubt as to the quality wash and bake your sand the first time you use it. However, not all impurities can be washed, boiled, or baked out of a substrate. Cleaning and drying sand can be messy. Make sure you cover the drains or use a plug when rinsing. Most rinse their sand and then dry it before returning it to a cleaned crabarium. Another alternative is to take the sand outside and place it in a bucket, use a hose to rinse the sand until the water runs out of the bucket and is clear. To drain the sand, place the sand into a pillow case so that your drains are not blocked up. Poor quality sand may also have metal shavings, test with a magnet. If you find metal shavings in the sand do not use it. The positives of sand include that it is attractive to look at, especially after some heavy hermit crab traffic, with their little marks in the sand. Hermit crabs love tunneling down in sand but you must be careful that you keep an eye on the level of dampness. If there is standing water or food items in damp sand you may develop mold (mould) or bacteria. This leads to a weakened condition, stress to the hermit crabs and can mean possible death. Many use a kitty litter scoop or sieve to pick through the sand on a regular basis to remove uneaten food or refuse. Another alternative is to add isopods to your tank to keep the substrate clean. The ideal primary substrate in your tank should be a good quality play sand with some coco fiber mixed in. The coco fiber can help with aeration in the sand as well as add humidity. This is the most common approach but some use straight play sand. Straight cocofiber is NOT recommended as it can causing molting deaths or abnormalities. These other substrates are safe to use in your tank but should not be your primary substrate as they do not allow for proper burrowing and molt cave building. Inexpensive and great remedy for sandy feet by for placing around the water dish. Hermit Crabs often wade through the water dish and then onto sand which then sticks to their wet exoskeleton. Placing river pebbles gives them a ‘drying off’ place and offers more traction. Make sure that the river pebbles that you purchase are NOT coated with resin or paint. DO NOT HEAT/BOIL/BAKE ROCKS. There are many natural river pebbles which are not coated around. One brand to ask for is Ultrastone Natural River pebbles. Coral sand can be purchased per pound/kilo from your local fish / aquarium store. 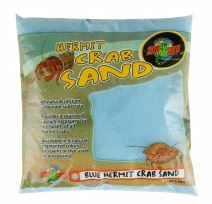 It can be expensive but it is a wonderful source of calcium for your land hermit crab. It is similar to Aragonite sand. Keep an eye on the coral sand for if it gets too damp it can disintegrate so try to keep it at ‘sandcastle sand’ consistency. ****Update note**** The larger grain coral sands are harder for the hermit crab to burrow and nest in for molting. The Carib Sea sugar and select grains that are oolitic are recommended to be placed within the crabitat. Geo-Marine: Florida Crushed Coral It’s the only crushed coral with aragonite, which provides up to 25 times the buffering power of other crushed corals, dolomite or oyster shell. Eliminate chronic pH problems and provide maximum surface area for water purifying bacteria. 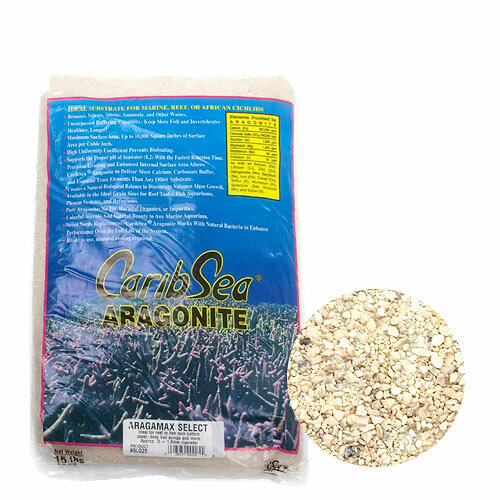 CaribSea’s Florida Crushed Coral with aragonite allows an increase in bioload by up to 50% and it never needs replacement! Approx 2-5mm diameter (1/8 – 1/4”). Cocofiber is often added to play sand to help retain humidity and moisture in the sand. The recommended ratio is 5 parts play sand to 1 part cocofiber. There are a number of companies that produce coconut fiber which is sold in compressed bricks, coarse chunks or loose in a bag. Moisten with brackish water for best results. Poor quality sand is not recommended as substrate. 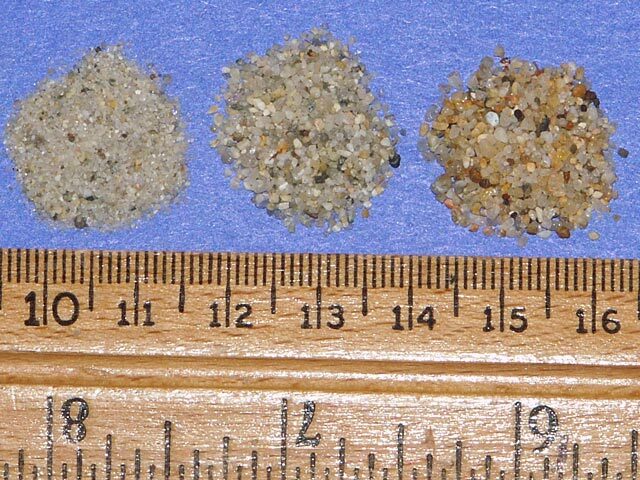 Sand that is too coarse can cause harm if lodged in the shell. In some instances hermit crab owners have found metal shavings in regular sand. Always look for play sand that is intended for children’s sand boxes. Highly prized by land hermit crab owners and aquarium enthusiasts. Unfortunately no longer sold in the United States. Now being sold to CaribSea company. Highly prized by land hermit crab owners and aquarium enthusiasts although it is much more expensive than the Tropical PlaySand. Aragmax is an Oolitic aragonite sand from CaribSea. Another is made by the ESV Company. Substrates which we DO NOT recommend are: Ground walnut shells, Corn Shavings, Cedar, Wood Shavings and other reptile beddings made for desert animals. Cedar shavings should never be used as it is toxic to all animals. The oils in cedar are used in pest control because of the damage to arthropods, which would also harm your land hermit crabs. If in doubt as to the brand found locally post a message to the Forum. Marketed for land hermit crabs but not suitable for the same reasons as Calci-Sand above. Comes in different colors that are unnatural and attract children. Aquarium gravel does not allow for proper molting and may become lodged inside the hermit crab’s shell.